Cosmetic, drug, OTC drug… If you read beauty blogs, you probably come across these words all the time. But, what do they mean? Why are some products called cosmetics and other drugs? Because cosmetics don’t interfere with any bodily function, they aren’t required to undergo strict tests to determine their efficacy. Basically, you can sell something that doesn’t work (and we all have tried our share of products that don’t do what they say they do) as long as it doesn’t contain anything harmful or dangerous. Contrary to popular opinion, you CAN’T put toxic stuff in cosmetics. For example, a sunscreen can prevent diseases, which is why it is considered a drug. Because drugs can affect the body on a much deeper level, they need to undergo very strict tests before they can be sold. These tests need to prove the product is both effective and safe. And, this takes a lot more time and money. But, if they don’t, they can end up in trouble. Of course! Cosmetics and drugs can have babies, and these are called OTC drugs, because you get them without a prescription. These hybrids need to comply with the requirements for both drugs and cosmetics. This is probably why so many moisturizers still don’t have SPF. How Is Intended Use Established? If you’ve read this far, you think that’s pretty obvious. But, have you noticed the “intended for use” bit in the definition? Those three words make things a lot trickier. You see, products are not classified one way or another according to their type (ie, lipstick or shampoo), but by its intended use. So, how is that established? It depends both on the ingredients included and the claims the product makes. For example, some ingredients, such as fluoride, have a well known therapeutic use, so anything that contains them is automatically considered a drug. On the other hand, products that contain ingredients that can alter the structure and function of the body, like retinol (it can boost collagen production and accelerate cellular turnover), can be considered drugs if they claim to only beautify skin. In addition, products marketed as cosmetics can be considered drugs when they claim to treat diseases or affect the function of the human body. This is the case for products that claim to reduce cellulite, increase collagen production, and accelerate cellular turnover. So, Is It A Cosmetic Or A Drug? Basically, the very same product can be considered either a cosmetic or a drug, depending on how it is marketed. For this example, let’s take a fragrance. Does it claim to only make you smell good? Then, it’s a cosmetic. Does it also claim to help you fall asleep? Then, it’s a drug. What Happens When A Company Gets It Wrong? That happened to Lancome. When the Genefique serum first came out, they said it could “boost the activity of genes” to turn back the clock, which makes it sounds pretty awesome. I mean, if you’re going to spend almost $100 on it, you want it to do more than just fill in fine lines and wrinkles for a while with silicones. But, anything that can interfere in any way with genes is considered a drug. This means Genefique should have undergone much more rigorous testing, which cost a hell of a lot of money. Lancome obviously wasn’t bothered to do it, yet thought it’d be a good idea to make drug claims to make people want to buy the serum. The result? Lancome had to hastily change the marketing spiel or Genefique would have been pulled from the market. Mind you, though, they didn’t have to change the formula. No one bothered to check if there’s anything in the product that can really affect the way genes behave. As long as Lancome limits itself to making only cosmetic claims, and uses no ingredient with a well known therapeutic history, it can keep using whatever it is it’s using. And, if you ask me, that’s fucked up. Because if the product can really “boost the activity of genes” then it needs to be throughoutly tested before it can be sold to prevent any possible unwanted side effects. And, if it can’t, Lancome should be punished more harshly for lying, don’t you think? Determining whether a product is a cosmetic or a drug can be pretty confusing, can’t it? I hope this post helped to clear things up a bit. QOTW: Do You Review The Beauty Products You Purchase? 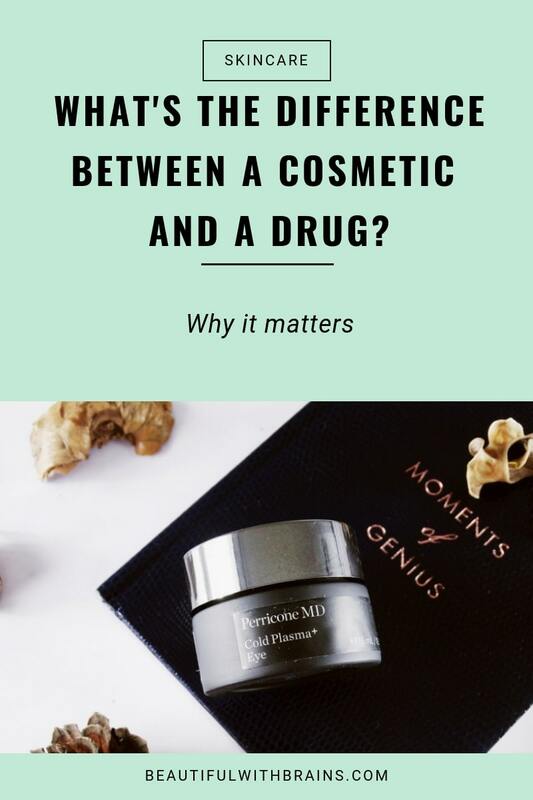 The cosmetic or drug debate is confusing sometimes. We have vitamin A, which is considered to be a drug and a supplement. But as retinol, it is also an ingredient in cosmetics. Hyaluronic acid is another example. Currently, the FDA does not regulate on cosmetics and supplements. Remember Latisse? It used to be a non-prescription item until the FDA found out the active ingredient is used in a type of eye drop. Dao, I agree that the whole thing can be really confusing. Unless one of the ingredients used has therapeutical properties, it really depends a lot on how the company markets a product and the claim they make. That’s why products with ingredients such as retinol can be considered both a cosmetic and drugs depending on the promises they make. I think it gets ridiculous sometimes and that there should be clearer rules. Monique, you’re welcome. I’m glad you enjoyed it.